It’s been a whirl year of books so far, but now things are settling down. This month–besides the release of Fortitude–I worked a round of professional edits on my next release. 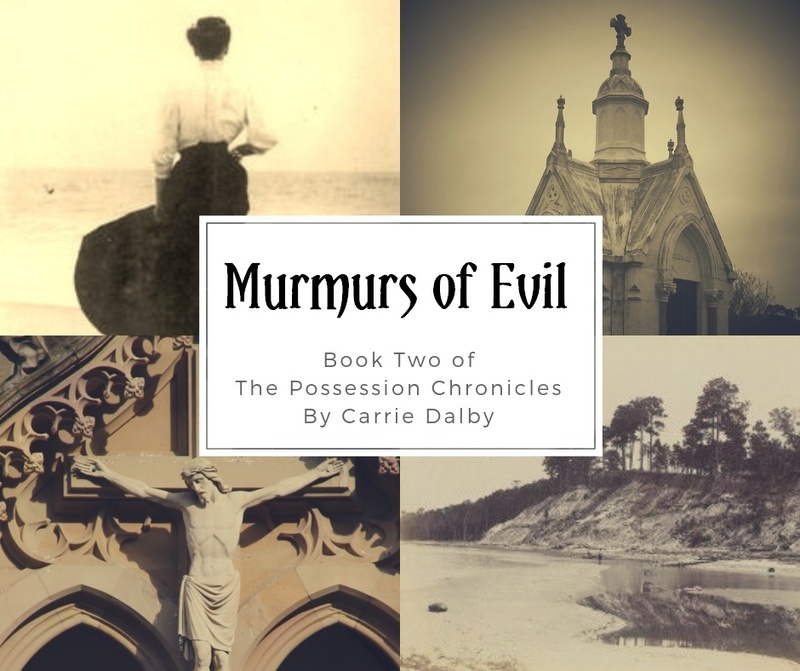 Murmurs of Evil, book two of The Possession Chronicles, will be available June 11. After finishing that editorial pass, I slipped into book three for a tightening round and now I’m on book four for the sixteenth time. I’m pleased to report the series is still as enjoyable for me to work on as ever–and that feels great. I’m excited to share more of The Possession Chronicles with readers, so much so that I started an insider’s readers group on Facebook for those looking for more facts and inspiration behind my stories. To join the fun and learn more about my writing process in regards to all my stories, check out Dalby’s Darklings. If an online group isn’t your thing, be sure you’re registered for my monthly newsletter. I send it out the first week of the month (next week for April), highlighting upcoming news/events, what I’ve been reading, and more. Sneak peek: next up, I’ll be at Gulf Coast Children’s Book Festival in support of Fortitude on April 4. Fortitude is ready to be back in the wild. March 5th by Bienvenue Press. While it did go through a round of line edits, no major changes were made. If you’re new to my books, now is a great time to order the digital copy as it’s on sale for $0.99. It will be on Kindle Unlimited and paperback ordering will be available soon. 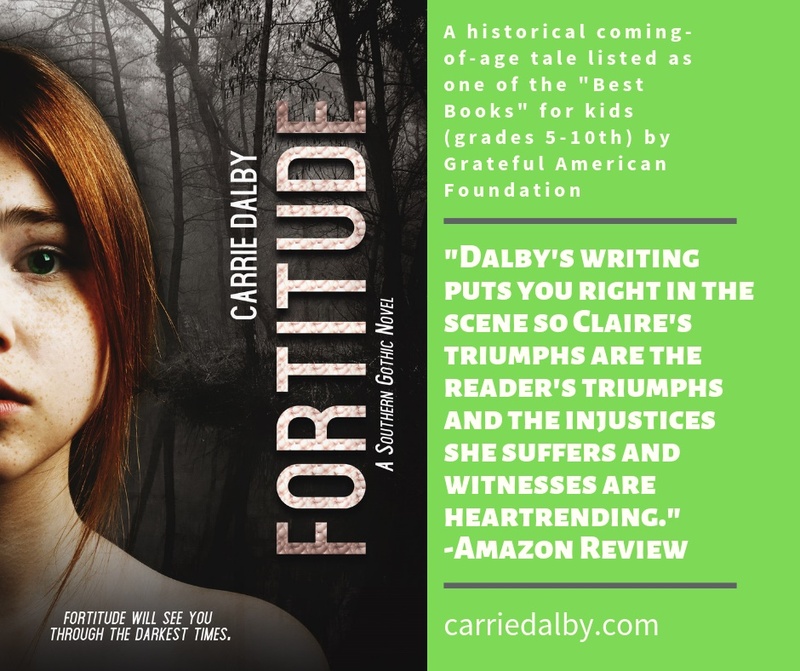 Fortitude is a coming-of-age Southern Gothic tale set against the backdrop of the Spanish-American War. Main character Claire O’Farrell is a first generation Irish-American from Dauphin Island, Alabama, and her best friend, Loretta Davis, is a Creole who lives in Mobile. Together, they volunteer as nurses in the Buffalo Soldiers’ camp in the Tampa Bay area. In the days leading up to departure for Cuba, more soldiers lost their lives in the Florida camps from disease and race riots than would die in battle. Dark days are recounted in this historical novel that earned ranking on the “Best Books” list for kids (grades 5th-10th) from Grateful American Foundation in 2017. Also out in the world this month is Mardi Gras Pieces: A Collection of Short Stories, an anthology compiled by Mobile Writers’ Guild. The Kindle version is released, paperback soon to follow. 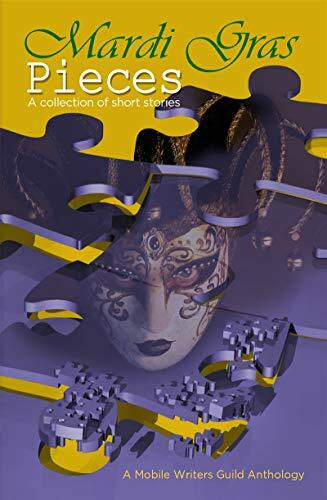 “Masked Flaws”, a prequel short story to The Possession Chronicles, is included. Told through the point-of-view of Edmund Easton, “Masked Flaws” takes place the winter before Perilous Confessions (December 1903-January 1904.) 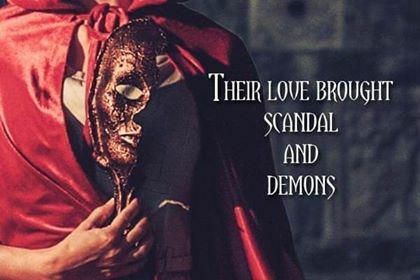 Want the backstory of Edmund joining Mystics of Dardenne and their infamous masquerade of 1904 that is hinted about in the first book? Read it in this one-of-a-kind collection by local Mobile area writers. Proceeds go to Mobile Writers’ Guild to help sponsor programming and literary outreach–like the Mobile Literary Festival that is happening on March 16, 2019. I hope to see you there. Mardi Gras. I’ve always had a love or hate relationship with it. As a child growing up in California one of the highlights of the year was a box of beads, throws, and Moon Pies my mother’s cousin would send us. 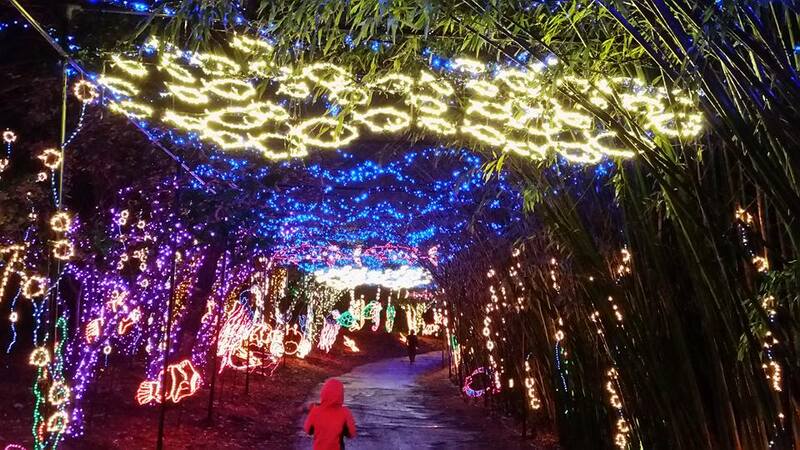 The magic of the sparkling beads, fun toys, and the wonders of sugar coated marshmallow pies. What wasn’t to love? As I grew older, my understanding changed. Carnival is a time of excess and indulgent behavior and people use it as an excuse to sin. Behind the beauty in the pageantry, filthy behaviors happen within some circles. Tens of thousands—and more—dollars are spent only to pelt parade watchers with plastic, guzzle booze, and litter the streets. Think of all the good that money could be used for instead—a waste! Then I discovered the historical origins and my understanding evolved further. Bachelors in Mobile began the first society as an impromptu parade through town to disturb the peace. The wildness was celebrating the New Year and the timing eventually expanded to be enjoyed before revelers humbled themselves for Lent. After the Civil War, people in the Port City needed something to lift their spirits and carnival was brought back. Today many of the societies donate to non-profits and do volunteer work throughout the year within the community. While parades and extravagant balls aren’t my personal style, I’ve developed an appreciation for the colorful history it gives Mobile, Alabama. Before I began writing what is now the first book of The Possession Chronicles, Perilous Confessions, I researched the history of Mardi Gras in Mobile through books as well as newspaper articles from the 1905 season I wrote about. I knew I didn’t want to use real society names, so I asked the opinion of a writer friend who had tackled high society and Mardi Gras in a contemporary setting for her YA/NA novel Want. Stephanie gave me permission to use the society she created for her modern take on carnival in my series. I had a lot of fun creating the roots of Mystics of Dardenne and I’d like to think Isaac Laroche would find the Dardennes’ antics entertaining—at the very least. Writing is all about stirring emotions. Things the author and the reader are passionate about are the best things to use, but passion isn’t always positive. The feelings I’ve had about Mardi Gras throughout my life (from wonder to disgust) can be found within Perilous Confessions. Just as with any topic, whatever your take on carnival season is I hope you’ll continue to find new information and insight to further your understanding of this unique event. 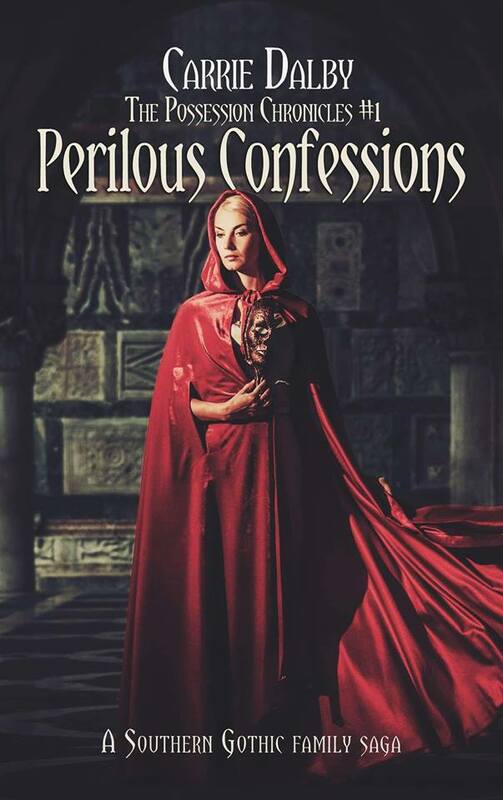 It’s release day for Perilous Confessions! You can read the first five chapters with the “Look Inside” option. (The digital sale price of $0.99 won’t last forever.) To check out Stephanie and her books, find her on Goodreads. Happy reading! It’s release day for this collection of romantic shorts. 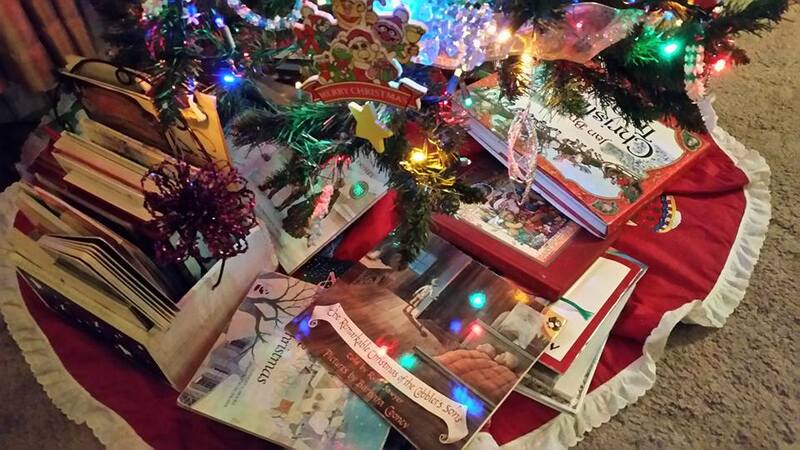 Find Hometown Heroes: A Christmas Anthology by Bienvenue Press in ebook and print. I’m happy to share “Courtship and Courage” with you as part of the transitioning of my historical works to Bienvenue Press. This all new short continues the story of Claire O’Farrell and Joe Walker from Fortitude. If you’re new to my writing, these two characters will make appearances in The Possession Chronicles, so you’ll want to catch up with them. 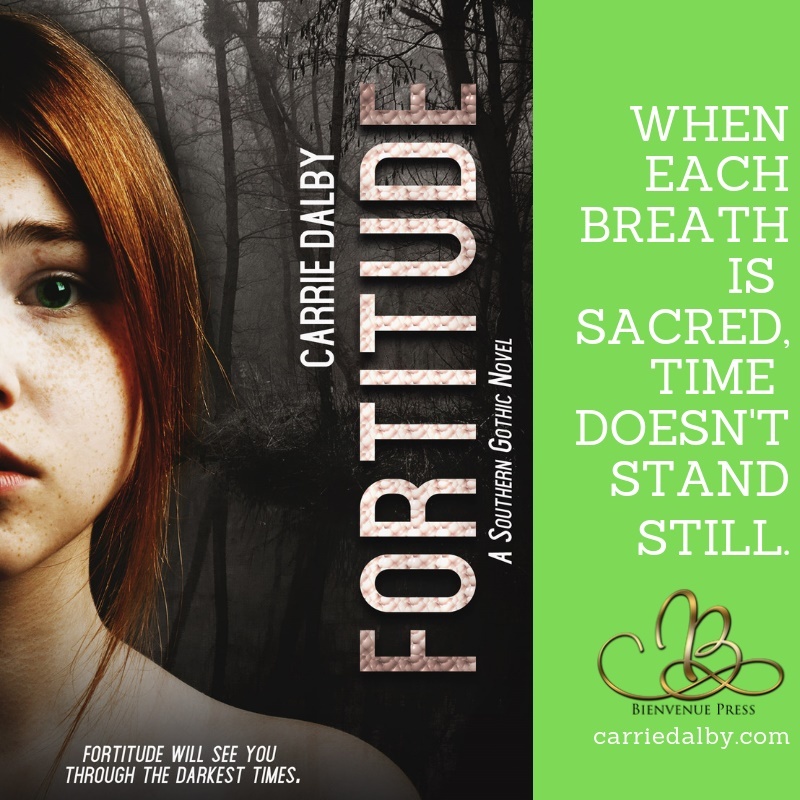 While Fortitude (and my other publications to date) have been primarily targeted for teens, “Courtship and Courage” is my bridge into writing for an adult audience. Since it’s the first story in the book, the “Look inside” option on Amazon allows you to read the first several scenes, so enjoy! As always, I’m open for questions and would love to hear from you after you read it. The weather’s going to change, right? We’re closing in on autumn but the humidity of summer is clinging to ninety-degree temperatures like it’s still August in Mobile, Alabama. 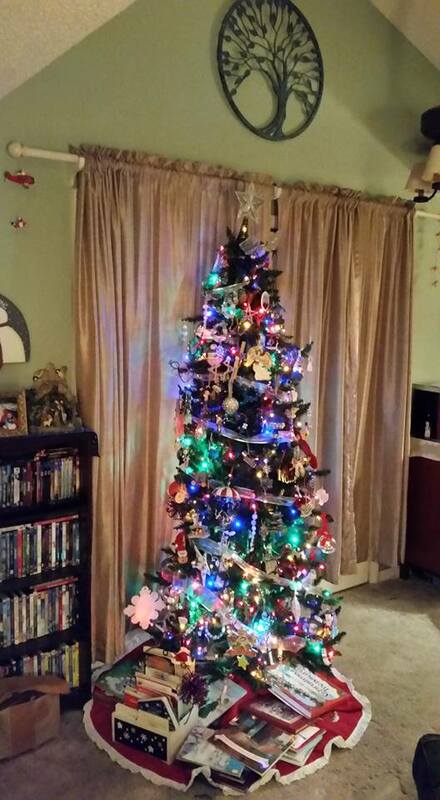 Here’s something to cool you down: Christmas. If you subscribe to my monthly newsletter (you don’t? Remedy that right now by signing up here), you may have heard that I wrote two short stories this summer for submissions to a couple different anthologies. 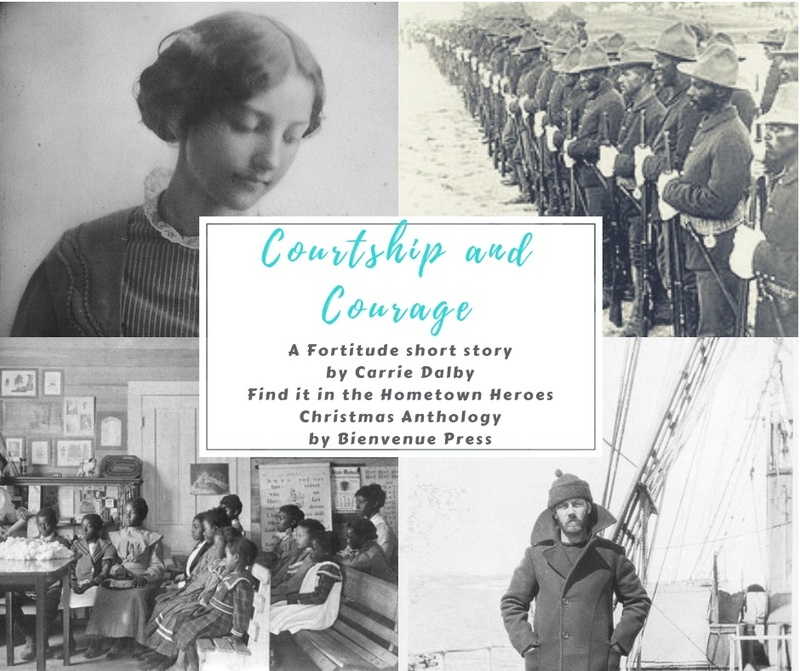 I’m happy to report that “Courtship and Courage” has been accepted into Bienvenue Press’s Hometown Heroes Charity Christmas anthology to benefit America’s Cajun Navy. Release dates/buying options will be forthcoming. If you haven’t yet, now is a great time to read Fortitude. “Courtship and Courage” begins the December after the book ends. While written as a novel for teens, it has proven to be a coming-of-age story that readers enjoy into adulthood. 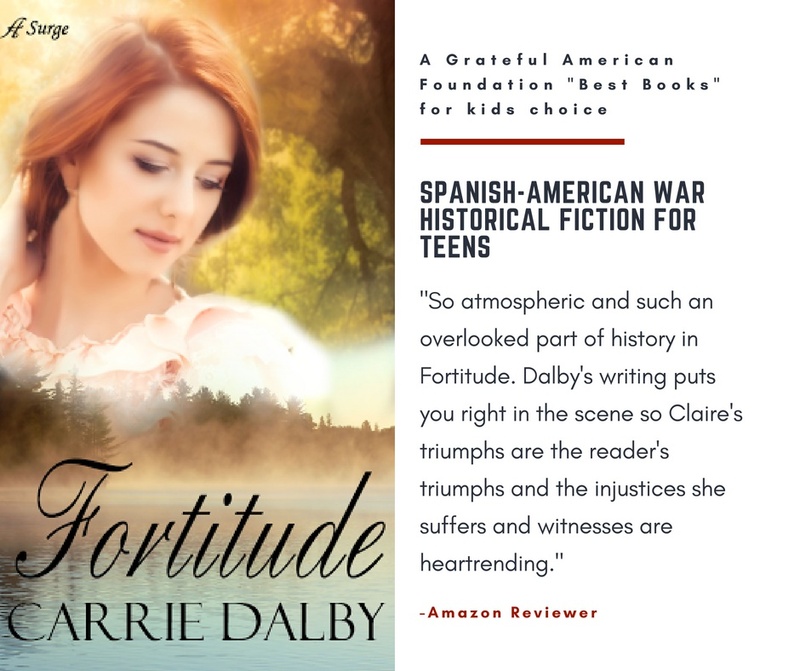 Fortitude holds rank as a “Best Books” for kids (grades 5th-10th) from Grateful American Foundation with only twenty-two other historical novels and non-fiction titles. You can read it free in Kindle Unlimited, purchase the ebook for $1.99, or buy a paperback through your favorite bookseller. And for those who have read it and always wanted a bit more about Claire O’Farrell, here’s the next stepping stone. Yes, that means you haven’t seen the last of her. Stay tuned for more. 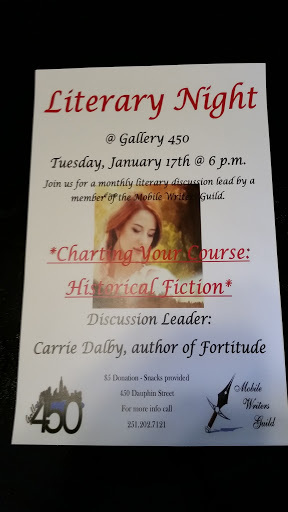 If you are in the Mobile Bay area, next Tuesday night Gallery 450 on Dauphin Street is kicking off 2017 with monthly Literary Night events, co-hosted by Mobile Writers Guild. Reminder: If you aren’t signed up to receive my newsletter, now is a good time to join the list.